August 27, 2008—Today, Nikon announced details of their latest DSLR, the D90, the successor to the D80. Pixel count has increased from 10MP to 12MP, continuous capturing is now faster at 4.5 fps (vs. 3 fps for the D80) and the LCD has gone from a low resolution (230,000 pixel) 2.5" unit to a high resolution (920,000 pixel) 3" unit. 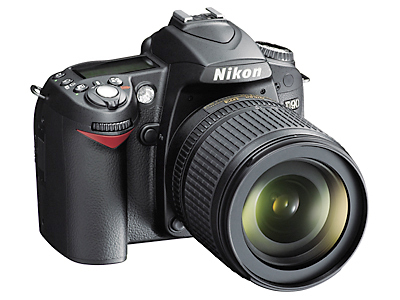 The Nikon D90 also adds a Movie mode capable of capturing 1280 × 720 pixel images at 24 fps HD with sound. This is a first for a DSLR and it’s a feature I expect to see a lot more since Live View is now a pretty standard feature (and Live View is required to shoot movies). The D90 also adds face recognition technology. At $999, the D90 is very competitively priced. The Canon EOS 50D, which was announced yesterday, is $1399 for the camera body alone, though the EOS 50D has a higher pixel count (15MP vs. 12MP), faster continuous shooting (6.3 fps vs. 4.5 fps) and a faster shutter (1/8000s vs. 1/4000s). On the other hand the EOS 50D lacks a movie mode and in-camera editing capability. The Nikon D90 looks like a pretty good camera at a very reasonable price. It seems to have all the features that most people will want and I’m sure the addition of the ability to shoot movies will boost sales. The available 18-105/3.5-5.6 lens with VR for an extra $300 is also something that might attract buyers to the Nikon D90. Photo.net’s partners have the Nikon D90 available in the following combinations. Their prices are fair and you help to support photo.net. MELVILLE, N.Y. (Aug. 27, 2008)—Nikon Inc. today announced the D90, a digital single lens reflex (SLR) camera that redefines the creative boundaries of digital photography allowing photographers to easily create stunning still images and High Definition (HD) movie clips with sound—with the same camera. A host of Nikon core technologies were leveraged to develop the D90’s scope of versatility, calling on years of photographic and optical expertise. Whether consumers are graduating from an advanced compact digital camera or are a seasoned D-SLR enthusiast, the Nikon D90 emphasizes brilliant image quality and versatility with its exclusive advanced Scene Recognition System, intuitive creative controls, blazing fast performance and the industry-first ability to create HD movie clips at 720p in the new D-Movie mode. Inspired by Nikon’s acclaimed flagship DX-format digital SLR camera, the D300, and building on the success of the wildly popular D80, the D90 delivers stunning image quality. The CMOS image sensor and 12.3 effective megapixels combined with Nikon’s exclusive EXPEED image processing system deliver outstanding images with fine details, smooth tones, brilliant colors and low noise across a broad ISO range. Photographers are able to easily compose stunning images using the Live View Mode on the large 3-inch 920,000-dot high-resolution LCD screen. The 11-point auto focus (AF) system utilizes Nikon’s exclusive Scene Recognition System and Face Detection to help make the best shot in a variety of environments. Matched with the new versatile AF-S NIKKOR 18-105mm Vibration Reduction (VR) image stabilization lens, and a burst rate of up to 4.5 frames per second, photographers can confidently capture fast action and precise moments as they unfold. Also helping to ensure no memory is missed, the D90 offers fast handling with a power-up time of a mere 0.15ms and split-second shutter response measuring just 65ms, eliminating the frustration of pictures lost to shutter lag. For the first time in digital SLR photography, Nikon introduces the addition of the D-Movie mode, allowing consumers to create their own HD movie clips (1280 × 720) with sound from their D-SLR camera. Photographers will appreciate the cinematic qualities that come from the 24 fps frame rate, which matches theatrical film, whether producing vacation clips or creatively melding stills with video. Additionally, the large size of the D90’s DX-format sensor, combined with the optical superiority and broad selection of NIKKOR lenses, provides shooters with the ability to capture amazing perspectives not possible with typical camcorders. D-Movie clips also benefit from Nikon VR image stabilization, which is automatically activated during recording to aid the low-light capability that trumps many other hybrid devices. Users can record movie clips onto an inserted SD / SDHC card, created as Motion JPEG AVI files that are easily edited with widely available video editing software. The D90 also features an HDMI terminal, allowing viewing of both pictures and movies on High Definition televisions. The D90’s unprecedented start up time and imperceptible shutter lag derives from the same standards as the professional sports photographer choice, the Nikon D3. JPEG bursts can be shot as rapidly as 4.5 frames per second, allowing photographers to capture detailed action sequences or catch fleeting expressions that might otherwise be missed. Images are also processed and previewed rapidly at 120ms, which is less time than it takes to move an eye from the viewfinder to the screen. Users are also able to creatively stop the action with a maximum shutter speed of 1/4000 second or create long-time exposures down to 30 seconds. Photographers will also enjoy advanced functionality anywhere in the world with system accessories designed for the adventurous globe trekker. When used with the Nikon GP-1 GPS unit (available separately beginning November 2008), the D90 provides geotagging to images with latitude, longitude and altitude data imprinted on the images’ metadata. Users can also prolong their adventure with the MB-D80 battery pack that accepts two EN-EL3e or six widely available AA-size batteries. Additionally, photographers can share and upload their images with a wireless interface optimized for the Eye-Fi wireless enabled SD card wherever there is a wireless network. Original text ©2008 Bob Atkins. i dont know what to take of this new camera. i just bought my nikon d80 like 2 months ago... used at a pro photo supply... should i of just waited... one thing i hate about technology and love about it at the same time is the need to be better. its like it is worthless real fast. everything becomes outdated you can never keep up. makes me wonder if i should sell my nikon d80 battery grip and lens for the price of the new one?! The D80 is certainly not wiped out by the D90. It remains to be seen if the D90's JPEG images are as crisp, and if it achieves low noise with as little loss of detail as the D80. As far as resolution, you are not going to actually see a difference between 10 and 12 mp! This is sure exciting - the D90 is everything I expected and more. I was going to upgrade to a D300 but now the D90 looks pretty appealing given it's $500 cheaper and have HD movie mode. Looks like the D90 would be on my Santa's list, unless someone can think of what the D300 can offer that the D90 can't. Do you or not have to buy an adjusted eyepiece to make the viewfinder suitable for your eyes? D90 come with the same sensor as D300, while D80 has the same you found in D200. Comparing D200 with D300 is not a fair competition. The same will be said about comparing D80 with D90. It's just a different leage. While waiting for my D90 kit to arrive I was kindly given a D60 to play with, and can I just say while the D60 is a nice little camera I was VERY IMPRESSED when I got my hands on my D90. If you are tossing up between the two cameras, GET THE D90!! It's worth every cent. With this release of the D90, the price of the D80 just went down to $599 at BandH which prompted me to get one. Add the extended service warranty for an additional 2 years and I do not have much to worry about. The D80 is still a great camera and completely capable of taking great pictures for the next few years. When the D90 drops down in price to the $700s, then it would be a great deal. You will most likely have the battery grip that works with both and the SDHC cards, which should ease the transition. Well said, Bob! You are right on the button! I have had my D90 for a week now and give it the big thumbs up! Was going to get a D300 but has the same spec as D90 but dearer. I also read kenrockwell.com D90 review to help me decide. I bought my D90 on September 30th. It seems easy to learn however I have not learned how to delete unwanted shots. 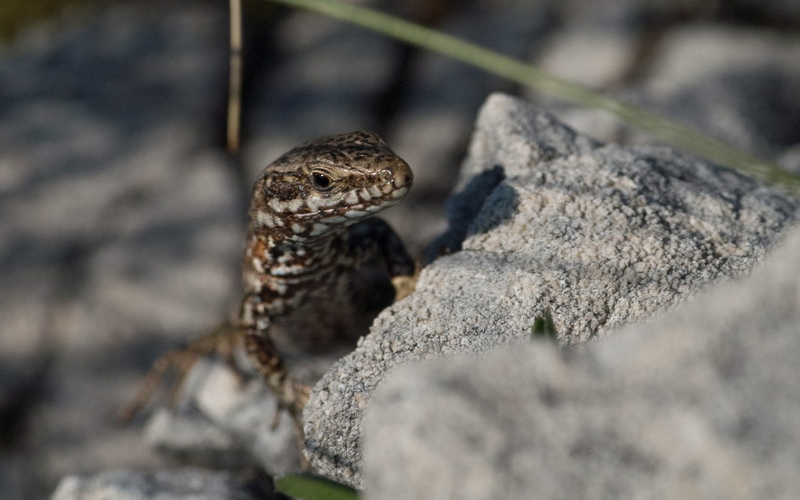 I need to photograph close ups of reptiles for research but need help finding the cheapest and best close up attachment . Can anyone advise me? Bob, you are absolutely correct. It is interesting how we as photogs might worry about missing out on a certain aspect, or feature of the next generation or incarnation of a camera, when more often than not, we have yet to master the camera that we currently own, and the potential it offers. What is now state of the art in camera technology was indeed pure science fiction just a few years ago -- and most of us enjoy this incredible technology as a hobby. Life is good! Excellent camera, with very little noice at high ISO. Compared with my previous D40x is a step ahead to functions, handling, Ease of use and performance. Also, light sensor is far more relieble and trustful. Though, i Dare to say that at ISO 100 (and only), D40x had better results. Video is the fun side of the camera (check it here: Nikon D90 videos), but i believe it comsumes a lot of battery. The "on-board" microphone, is crap, the sound is terrible. Too bad that there is not an input for an externel one. I am also wrestling with the D90 v D300. There is not so much of a difference here...maybe 20%. I can't afford a D700. I need a robust and better sealed body than a consumer version, but would not need something the size of the D3. Any comments would be appreciated. I'm going with the D90 / 18-200VR combo for about what I would have to pay for a D300. The main reason for considering the D300 was the robust and sealed body. Everything else on the D90 is as good if not better than the D300. the firmware seems to be better than the D300 so the sharpness and noise control is better than the D300. I'll trade up when I can afford the D700 (or its successor). RE: Karl Feltig , November 13, 2008; 05:38 A.M. >The "on-board" microphone, is crap, the sound is terrible. Too bad that there is not an input for an externel one. My sentiments exactly. I only echo what's already been mentioned because I gave a brief review on a different site that said the same but haven't seen a similar comment elsewhere. As such I was beginning to wonder whether my camera had a faulty microphone, at least I now know there's at least one other out there. Personally I wouldn't go as far as to call it a problem as I look upon the video functionality as more of a gimmick. I only picked up on it as I was trying every possible feature and it was the only negative point I could find, but them I'm no pro and maybe I'm easily impressed The only really important point is that the quality of the images is absolutely incredible. That is true, it does not sound like a Bob Atkins review. Having said that, I am a Canon shooter too, but I have noticed that Nikon has come a long way from where they were. Given a choice today, I would pick up a Nikon over a Canon. Nikon is designing their cameras more from the perspective of the Photographer. I debated between the D300 and D90 for months... Finally pulling the trigger on the D90 Kit. Retailing at 1299 there is no better camera for the money right now. Excellent Low light shooting. High ISO's with low noise! Unless you absolutely need the high (6fps) frame rate, 51 auto focus points and bulky more durable build the D300 offers, save yourself some money and get the more affordable D90. It is worth every cent. The 18-105VR kits lens is a steal as well! I just got my D90, upgraded from a D70. WOW! I am still learning the fine differences in operation between the two. But for my first impressions, here is what stands out for me. * Working with files double the size I am use to does tax my CPU noticeably. The computer is still waiting for me most of the time. I have gotten use to it waiting for me ALL the time, but no long with the D90 RAW NEF files. This is not an inconvenience, but just something different worth pointing out. My PC is a HP laptop with a Intel Centrino Duo processor & 3MB RAM. * Also, presently I am using several 1GB SD cards - as in the 1st generation of SD cards. These are extremely slow. I will be getting a few 2GB or 4GB SDIII cards soon. However, the price is falling as I am typing, so I want to hold off for as long as I can tolerate the slow cards I already have on hand. I am thrilled with my D90! As I learn more about it, I will follow up if something else is worth mentioning or repeating. Just bought one of these a few weeks ago to replace my D80, whilst I await another year or so in progress in the full frame model range. First impressions are that it is very like the D80, rear screen is nicer, live view feature interesting too, have tried out the movie mode by accident and it seemed okay. What I don't like is that I find the metering very erratic compared to the D80. I know that people always complained that the D80 clipped highlights, but mine gave me good results 99.9% of the time. However, the D90 is very inconsistent with its metering. I took some macro pics the other night, simple subjects, yellow daffodils and some pink alpine flowers in good light, yet some of the images were very over exposed, whilst others were perfect. I kept watch on the histogram and had to reduce exposure by approx 2/3 of a stop on some of the images to get a result with a balanced histogram that looked to have good colour on the rear screen. I've been taking pictures like this for years, originally with an Olympus OM4ti before the D80 and never had any issue with this sort of exposure issue before now. So, in some ways the D90 might be better than the D80, but metering isn't one of them. But, if you know what you are doing you can work around that, although you really shouldn't have to. I have used my trusty old D50 for four years, and just today I purchased a D90. In fact, I'm charging the battery for the first time right now. To people who complain about the speed at which cameras change, just have a look at my page--all done with a 6.1 megapixel D50. People who feel they must have the most recent and high-tech camera are missing the whole point IMO. Photography should be a creative endeavor. It's what you do with what you have that counts. I bought a D90 fairly quickly when they were released. I had been using a canon rebel xti for about a year and a half when the on board flash stopped working. the camera. that was not the only issues I had with it built. anyways I jumped ship and bought the Niikon. I have never looked back although some of Nikons practices tick me off. I see no reason to raise prices on glass that has been out for a year or 2. I have thought about upgrading but the camera still works as new so i have no complaints. better to master the camera you have than to constantly upgrade for no reason. Today, I walked out on my Nikkormat of 30 years and her family of pre-AI lenses, and into the arms of a bright young D90. Who says you can't be young again. I have a D70 and the D90. I have shot thousands of pictures with the D70 and still shooting with it. While also shooting with the D90. Which is the better camera probably the D90 in many ways. Yet have no reason to or even thinking about retiring my D70 no way. As far as constantly upgrading to the next high level say into the pro models won't do it. For one I am not a pro. Two there is no sense in spending a ton of money on a camera with a bunch of features you will never use. Not one of the big buck cameras will make you a better photographer. I have seen amateurs with big buck cameras shoot bad pictures and have seen pros shoot with the cheapest digital point and shoot take great photos. Don't get caught up in the hype of as they say keeping up with the Jones or technology unless you have a ton of money and can afford to spend it like water you will never be able to keep up. For by the time you buy the latest one on the market you already buying a camera that is out dated. That is how fast technology is changing. If your an amateur or an advanced amateur then get a camera that offers you the best you can afford for the type of shooting you plan on doing. All the little whistles and bells will not make a bad shot better. After all it is the person standing behind the camera that makes the shot good or bad. Chase Jarvis a high end commercial photographer said it best: "The Best camera is the one that's in your hand." I just got my D90 with the 16-85mm Nikon zoom. I've been using a D50 with the 18-70mm Nikon zoom for the past few years and have passed this on to my daughter. I really enjoyed the D50. But the physical controls, view screen, and the additional features were too much to resist on the D90. So far it's great! I think I'm at my dream set now - I also have Nikon's 12-24mm and 70-300mm VR. The down side is now I have no excuse for lousy pictures!